Exquisite red carpet elegance oozing absolute couture craftsmanship. The diamond stiletto for all occasions. SKU: MKJUNA-WHT. Category: Evening & Bridal. 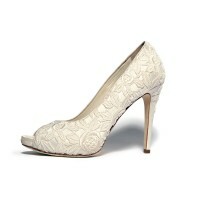 Tags: Lace, Peep-Toe, Pump, Satin, Stiletto-Heel, White/Ivory. Be the first to review “Juana (White)” Click here to cancel reply. Exquisite red carpet elegance oozing absolute couture craftsmanship. The diamond stiletto for all occasions. Slight discolouration at back. 50% French Guipure lace upper. Strass buckle / loop feature.